I’m hoping to make this post a bit interactive, by posting very little beyond the title question and an image. This, as many will know already, is the Tiger/Python mount originally in William Bullock’s London museum around 1813. Today, it’s in the natural history gallery at one of our partners, Rossendale Museum. There’s an accompanying label, dating to 1898, that says that this should be seen as a demonstration of the taxidermists skill rather than a representation of a real occurence. So, a simple question, one children ask of taxidermy all the time: Is it real? Hopefully we’ll get plenty of different ideas, then at the end of next week (Friday 5th) I’ll post another article with my own thoughts, and more about the specimen. We’re not looking for a simple yes/no here by the way. There is no right or wrong answer. you can take the question and answer it in any way you see fit. Matt’s answer being a great example of what I’m talking about, a yes and no answer. It is half-term, so we are getting quite a few “is it real” questions. Our answer is “Yes”. This is where problems can start as the questioner usually means “is it alive?”. There is often a follow-up question along the lines of “why does it not move?”. We usually then explain about the taxidermists art and invoke lurid use of scalpels, scissors, chemicals, and the use of skin and osteology collections. If I was in the Rossendale situation I would say the example is real, although the setting or situation is contrived, but the label does explain this That opens up another theme – “does anyone read labels”? I like this post – very thought provoking. To me, the most ‘real’ aspect of this exhibit (aside from the real skins used in the mounting) is the window into what Regency museum-goers expected to see. The sometimes uneasy fit between spectacle and scientific veracity is something that has existed a long time, and remains today. A good example is the mounting of moa bones. Moa (extinct ratites from New Zealand) were the tallest birds to have existed. In life their stance would have been long instead of tall, carrying their heads about shoulder height to aid in browsing. However, mounts of these birds typically show them tall, like giraffes, to emphasise their height. Early museum workers even added vertebrae to specimens in order to excentuate this. Most interesting to me, though, is that this Victorian-era practice still persists in many museums today: many moa (even in New Zealand) are still deplayed this way. Research demonstrates that in the minds of visitors museums are purveyors of ‘truth’ (whatever that is). Interesting as the tiger mount is, I wonder if it’s place isn’t in a natural history gallery, but as part of a display on either quriky taxidermy or life in the early 19th Century. I think Matt summed it up very nicely – it’s certainly very similar to the answer I give when asked that question by visitors to the Horniman. The crux of the question is ‘what does “real” mean?’ and that depends on the understanding and the perspective of the person asking the question. 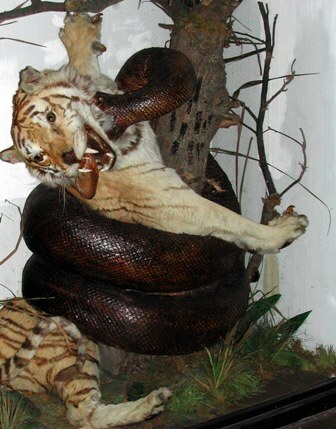 One person may mean ‘is it a real snake eating a real tiger that has been preserved’ or it may mean ‘is it a real Georgian taxidermy scene?’. Identifying the questions asked by audiences allows a curator to tailor interpretation so that it addresses what most of the audience wants to know, but what can happen is that curators impart the information that they find most interesting, leaving the FAQs of their audience unaddressed. Since layering information becomes difficult when label text is limited to a few tens of words, the challenge has to be in getting the most useful information out on display, but leaving a hook that makes the audience eager to seek supplementary information, be it online, in books, from staff, etc. The ‘is it real?’ question is a great example of a ‘hook’ that engages audiences. As to the whole tiger vs. python thing, it’s pretty unlikely. The python would have a tough time imposing a constricting coil with a tigers paws free to kick and its jaws free to bite. It might just manage, but it would be in bloody ribbons by the end of the struggle. I was sorely tempted to delete this comment, because I actually planned on using this piece of footage when I expand on this next week!